But not according to everyone. I just wrote about a guy who wanted to change his age legally, and got turned down. But now, this? Does no one want to be the age that they are? This was the oldest person ever though, so let’s here the story out. This lady didn’t want to be any younger though like Emile Ratelband. Nope. In fact, she added a couple of decades to her age, or so it has been said. She is currently known as the oldest person who ever lived. Unfortunately, she is now also known as the lady who may have added 23 years to her real age. Jeanna Calment died in August 1997 in Aires France. 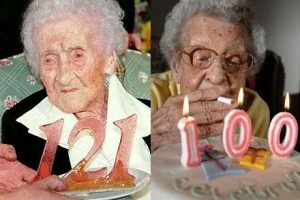 At the time, she was reported as 122 years and 164 days old, also known as, the oldest person on record. However, when researchers stated that the woman who claimed to be Calment was actually her daughter, Yvonna Calment, 99. A new paper suggested that Jeanna Calment died in 1934 and that Yvonne Calment assumed her identity so that their family wouldn’t have to pay inheritance taxes. The evidence collected includes an identity card that was issued to Jeanne Calment in the 1930s that does not list the same hair color or height that she “had” later in life. There was also a birth certificate of a maid that Jeanne Calment said took her to school as a child. “It turns out that she was 10 years younger than Jeanne, which means that she could only be taking her daughter Yvonne to school,” he said. A the end of the day, the evidence does not stack up and although the researchers think they know what happened, others disagree. Either way, this is an odd story. And that’s what Oddee News is all about, odd news.